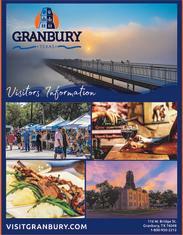 Summer is coming to an end but there is still time to get out and play in Granbury. Take some time, grab some friends and rent a surrey bike to ride along our beautiful Hike and Bike Trail or enjoy an afternoon playing in the sand at the beach. If golf is more your speed, you can tee it up and one of our beautiful golf courses or try your hand at Granbury’s very own Disc Golf Course. If you are looking for bit of a thrill, why not stop by and rent a personal watercraft to kick up some waves on the lake or try your hand atpaddle boarding. If you prefer to keep your feet on dry land, challenge your friends to a game or two and send some pins flying at the local alley or catch a movie as the sun sets. After all of that excitement why not take some time to grab a bite and sip on some local perfection. August in Granbury is the greatest place to take in a concert or indulge in the local art scene. You don’t want to miss out on any of the fun going on, book your stay today!